Overclock.net > Graphics Cards > AMD > AMD Cooling > [Official] AMD/ATI GPU Mod Club - AKA "The Red Mod"
[Official] AMD/ATI GPU Mod Club - AKA "The Red Mod"
The purpose of this group is to devote and assist in the growing interest of using a conventional self contained CPU cooler as a GPU cooler. There has been a growing group of people taking the risk and modding there GPU cards to accommodate a conventional CPU cooler. This group is established to share and inform peoples experiences and results when undertaking "The Red Mod"
Those that are considering the mod should know that they take full responsibility for the outcome. If you don't feel comfortable tearing apart your GPU with the possibility of forever destroying it, then DON'T DO IT. Modding any GPU can and may void you warranty. I will be encouraging some of those that have successfully attempted "The Red Mod" to post there info here. For those undertaking the mod they are encouraged to create a full work log here on OCN with benchmarks before and after using at least Furmark and or Heaven. Pictures are strongly encouraged before, during and after the mod. BMGJET - Antec 620 - HD 6850 CF - 30% Overclock. To Join please post a picture of your setup in this thread with any benchmarks/temps, Then PM me a link to it along with what cooler and gfx card you are using. This Group/Club is based off the Original "The Mod" in the Nvidia Cooling section by Rage19420. Thank you for letting me copy your Group/Club for AMD/ATI Cards. 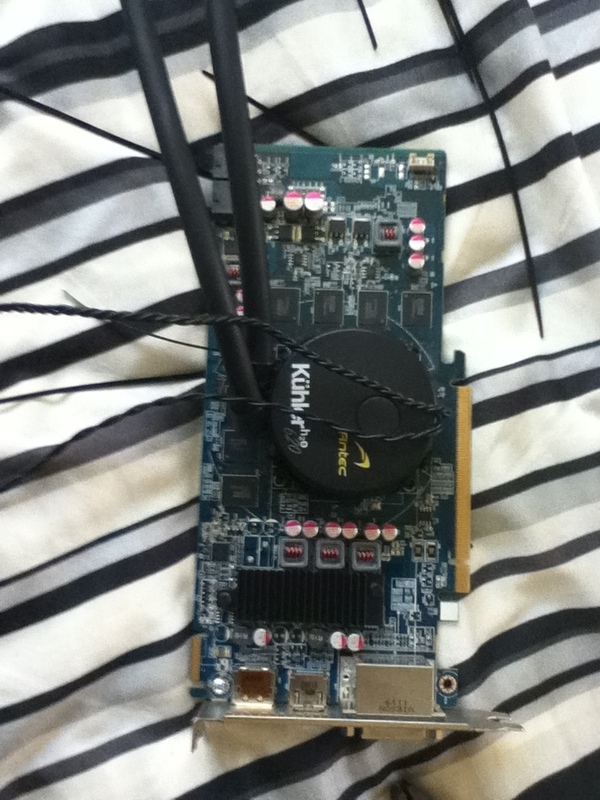 Here is the overclocking tool I use. Its command line based but I included a sample Bat file. There is a nice guide here that may help you. Great job bmgjet and for all those members who done this fantastic mod too. You all deserve +reps for taking the risk. Tempted to do it to my 7970's but Id rather wait a few months before voiding the warranty. Good to see you got it working, Now you should see how far it can be overclocked. Do you think this will work for the 5 series... more specifically the 5870. Are the mounting holes the same for the 6 and 5? 58 and 68 series holes are the same so it should work exactly the same. Altho hole spacing doesn't really matter when you use cable ties since they allow for a lot of change. Just have to be more careful with cooling the VRM on the 5 series since the run a bit hotter. But as long as its got some air flow it should run cooler then stock since hot air isnt being blown on it. What about the VRM cooling? Aslong as it has some air flow from like a side case fan it will be sweet. Mine runs cooler then with stock fan since its not getting hot air from the cooler blown on it. Im not sure for amd temps as i have nvidia cards but those look to be very good imo. My rad hoses are too short to reach any intake spots so ive got the rad dangling from the hoses about four inches from the bottom intake. It was secured to the bottom but a new psu (larger psu than the one i had before) has covered over most of the screw holes for the fan in that spot. My H70 hoses are to short to reach any other spots in my case. Even with that said my temps have dropped another 4c of load temps by doing this. I think i was kinking a hose or too many angles before, either way im happy for the decrease in temps. As the other asked about vrm and vram temps my 560ti had no cooling beyond the H70 pump and i left the shroud on, i was fine for months running the card like that, even heavy ocing did not seem to affect the performance. Looking back though, as i had no replacement card i would not do that again without a spot fan of some type to the pcb. Ill post up some pics, i was going to wait to get my sleeved cable extentions before posting pics as i no longer have a fully sleeved psu but to show the setup ill post the ugly stock cables. Overclock.net - An Overclocking Community > Graphics Cards > AMD > AMD Cooling > [Official] AMD/ATI GPU Mod Club - AKA "The Red Mod"